JA BizTown combines in-class learning with a daylong visit to a simulated, fully interactive town. The program helps students make the connection between what they learn in school and the real world. The JA BizTown program includes 12 required teacher-taught, in-class lessons. 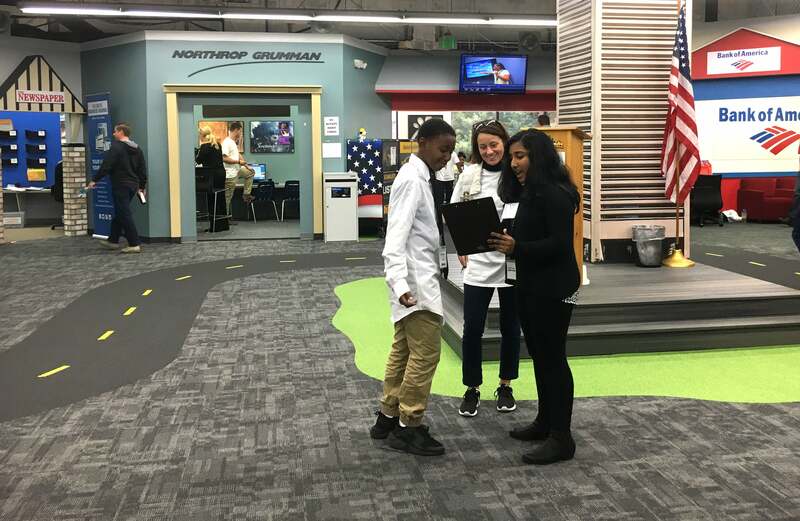 The program culminates with students participating in the hands-on simulated community, either at a JA BizTown facility or at a mobile unit. An in-class debriefing lesson helps students construct meaning from their experience. Additional extension activities are available for each topic. Discuss the roles they as citizens play in their community as workers and consumers and relate these personal roles to the free enterprise system. Discuss the importance of citizen rights and responsibilities in a community. Demonstrate a basic understanding of the free enterprise system. Explain the importance of philanthropy in our communities. Build money management skills through a practical knowledge of economic concepts and banking practices. Develop an understanding of basic business practices and responsibilities. Volunteers are needed to mentor small groups of students throughout their day at JA BizTown. No special budgeting expertise or preparation is necessary and thorough training is provided for all volunteers!